Business transformation is the destination. Your technology roadmap will take you there. As digital disruption impacts your business, you’ve probably invested a lot to prepare your customer-facing operations to meet the next challenge. But what about your internal functions? Are your finance, HR, procurement and supply chain teams effectively leveraging digital innovations to help drive the business forward? • Is my technology strategy truly aligned to meet my business goals—today and tomorrow? • What technologies will empower a large-scale transformation of my back office? • How are my peers modernizing internal processes to compete in a disruptive world? 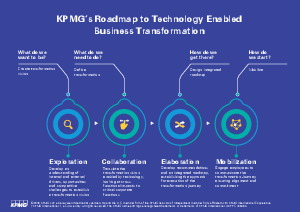 KPMG Technology Strategy and Selection gives you the tools to frame such decisions by helping you clear the fog of disruption and see what’s coming next. We’ll work with you to develop an integrated approach to technology selection and strategy based on where your individual business is headed, helping realize your transformation vision.